Observed attracted to electric lights at Marigat, Rift Valley, Kenya, Africa. October 2010. Length about 24mm. 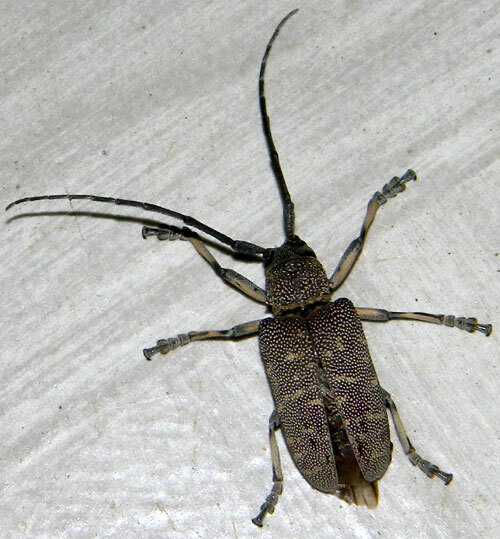 Longhorn beetles are the adult stage of grubs that tunnel into dead twigs, branches or roots of trees and shrubs. Some species cut off the flow of tree sap into a twig by girdling it first. Adults lay eggs beneath the bark and the emerging grubs tunnel through the wood leaving a flattened oval gallery.